Why are collegiate video coordinators going lamp-free? How do the best college teams motivate Generation Z players before a game? “We’ll make a two or three minute motivational film each week to help keep them pumped up,” said Christopher Luke, President of the Collegiate Sports Video Association (CSVA). The content will vary with the sport and the school, but Luke says the approach is almost universal. 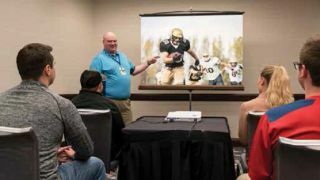 In addition to an inspirational video, most CSVA members will show highlights from previous games, film of the opposing team and lots and lots of “cutups,” clips of specific plays chosen to help young athletes understand how to do their jobs. Luke, who has been a college football video coordinator for almost 18 years, has hauled thousands of pounds of video players, computers and large screen displays into hotels across the country. Today, however, he travels light. His video player, an iPad or Microsoft Surface tablet, weighs less than two pounds, and his projector—a LampFree Casio XJ-A252—is just 5.1 pounds. “It’s the best setup we’ve ever had,” he said. It projects a big, HD image, looks great, and turns on and off instantly. That’s important, he explained, so that the video coordinator can run and catch the bus with the rest of the team, even though coaches like to use video at the end of pregame meetings. In most college sports, the video coordinator doubles as a coach or as an operations director, because there isn’t enough funding to support a video position year round. Yet in football, especially in the bigger programs such as at North Carolina, where Luke is Director of Football Video Operations and Technology, it make sense to have one or more full-time people. That’s not to say there’s no value in diagramming plays or marking up video. On the contrary, the “John Madden” markup is crucial to sports education everywhere. But Luke prefers a tabletop touchpad like the Pointmaker, sending the markups to a projector, so he can create the visual impact he needs. Christopher Luke, president of the Collegiate Sports Video Association, has been a college football video coordinator for almost 18 years. He’s hauled thousands of pounds of video players & displays into hotels across the country. Today, however, he travels light. Given the need to haul in equipment, it’s been a trick over the years to provide big-screen impact in a hotel, but that’s not the case anymore. About three years ago, Chapman told Luke about Casio’s LampFree projectors, which use a hybrid LED and laser light source instead of a projection lamp. He, in turn, has recommended the product to other video coordinators, and the projectors have become popular, especially with college and professional football teams. “I’d be willing to bet at least 50 different schools are using them now,” Luke says. “It’s a great all-around projector, but the biggest thing for me is being able to turn it off quickly,” he adds. “It never gets hot, so there’s no need to sit and wait while the fan cools it down.” Other advantages are its small size, light weight, bright, 3,000-lumen image and WXGA resolution, which translates to 720p high-definition video. “The LampFree feature is huge, because I don’t have to stockpile expensive bulbs or worry about one failing while we’re on the road,” Luke adds. Unlike standard projectors with their 2,000-hour lamp lives, the Casio light source has a 20,000-hour lifespan, which is 10 to 20 years for most users. Part of the appeal of the Casio projector is its price: initially a little more than a traditional projector but far less when you add a lifetime supply of lamps. Then, too, the cost is a small fraction of the price of renting projectors for a season of meetings and banquets in hotels.